METTLER TOLEDO's XPR microbalance, which combines a series of creative features to allow accurate weighing of very small sample sizes, has received a 2016 Red Dot award. The international award recognizes XPR's high design quality and exemplary innovation in form and function. Annually awarded by Germany’s Design Zentrum Nordrhein-Westfalen, the Red Dot Award is an internationally recognized quality label. METTLER TOLEDO is extremely pleased to have received the coveted award for the innovative design of its new XPR microbalance. 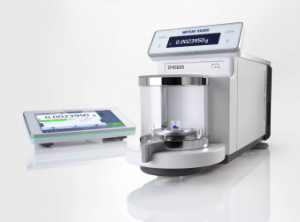 The XPR microbalance was recognized by the jury of design experts for bringing together a unique combination of features that streamline weighing and allow use of minimum sample sizes for potentially significant monetary savings. Features singled out included Active Temperature Control (ATCTM), which helps keeps balance temperature constant for heightened accuracy, and the balance’s SmartView terminal, which makes XPR easy to use. In recognizing the new terminal software, the jury enjoyed XPR’s easily identifiable, self-explanatory icons displayed on its smartphone-like touchscreen. Operating the balance was even described as fun, a benefit that can help operators remain fresh throughout a workday. Additionally, because the touchscreen is intuitive, extensive training was not required prior to first use. Other features recognized were the XPR microbalance’s self-monitoring internal quality assurance, which helps to maintain confidence in results; ergonomic solutions such as SmartSens, which keep the operator focused to avoid mistakes; and helpful functions such as the built-in notepad, which can be used to provide redundancy for manual results notation. Concluding its review, XPR was also recognized by the jury for its durable, quality, and ultimately green materials. None of the materials used in its manufacture are environmentally incompatible and the packing could be reduced by 46.6% in volume and 27.6% in weight, which decreases pollutant emission during transport. To learn more about the METTLER TOLEDO XPR microbalance and how its innovative blend of features can streamline weighing of small sample sizes at your organization, please click here.